The Bourne Supremacy is in a sense more of the same: quick cut action scenes, complicated storyline, and more unfolding of Jason Bourne’s past. However, while Identity is primarily a mystery, Supremacy is more revenge based. Again, I’m not that into these movies, and I found this one less interesting than the first. I did find some things to enjoy, though. Karl Urban appears as an assassin who frames Bourne for a murder and attempts to kill him. I love Urban, both as an actor and for his ability to pull off an unshaven face. There are also some pretty cool chase scenes, both on foot and by car. I was a bit disappointed that Bourne’s love interest from the first movie was killed off so quickly. She didn’t do much in Identity, but she added a fun dynamic to the film. Her death casts a bit of a shadow over this movie, not only because Bourne is seeking to avenge her death, but because there’s no one for Matt Damon to banter with. I suppose her death was necessary to further develop Bourne’s character, but she would also slow him down. There’s only so many times you can have her off to the side freaking out while Bourne beats someone up. Matt Damon returns as the amnesiac super spy, Jason Bourne. This film is very similar to the first as Bourne tries to piece together more of his past while being tracked by a secret section of the CIA. Damon is again great in his role, he is able to elevate these films above the standard action fare and make them something more. I’ve referred to the Bourne movies as action films with a brain in the past, and that is absolutely true here. 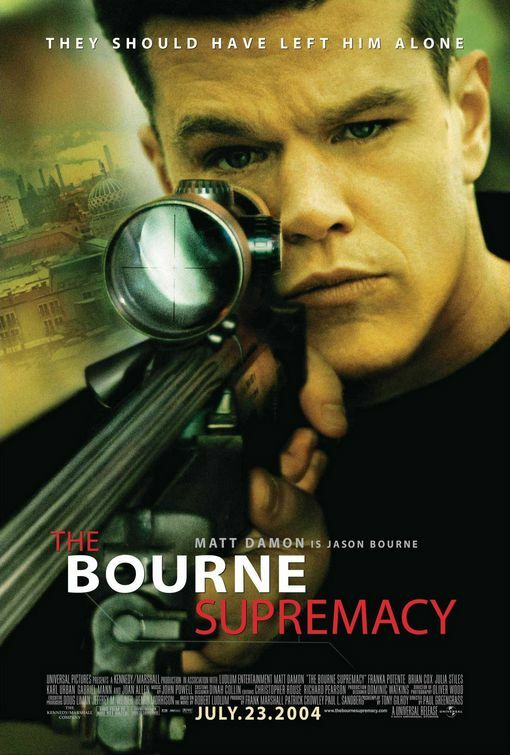 This follow up to The Bourne Identity is another intense trip through Bourne’s past. It also ups the ante in terms of action, showcasing one of the best car chases ever put on film. It’s the best car chase I’ve seen since The Blues Brothers, a brilliant scene set in the streets of Moscow. The film starts off with Bourne living a secluded life in India with his lover Marie (Franka Potente). They have been travelling around the world with the hope of outrunning Bourne’s former employer, Treadstone, a clandestine section of the CIA. When Bourne is framed for a murder in Berlin, he must come out of hiding to find the real culprit, while also avoiding the new director of the Treadstone program (Joan Allen). Along the way, Bourne will discover more about his forgotten past, particularly his first assignment, an assassination he did in Berlin. This is a great follow up to the original Bourne film. Damon is a believable spy and adds a gravitas to the role that not many actors could. He is also joined by a solid supporting cast. Karl Urban plays a Russian assassin and major antagonist for Bourne throughout the film. Joan Allen and Brian Cox are also great as CIA agents out to get Bourne for the murders he is framed for. The action scenes are fantastic and have obviously been aided by a larger budget due to its predecessors success. This is the closest America will get to having their own version of James Bond, especially after the new series of films, starring Daniel Craig, seem to be using the Bourne series as a blueprint for their own films.